Bobbin and Needlelace has been made in Devon since, at least, the early 17th century. It was a cottage industry, by which the wives, daughters and other females related to mainly farm labourers and fishermen supplemented the family income. It was made in towns and villages throughout the East Devon area. HONITON LACE is made with bobbins using very fine thread. 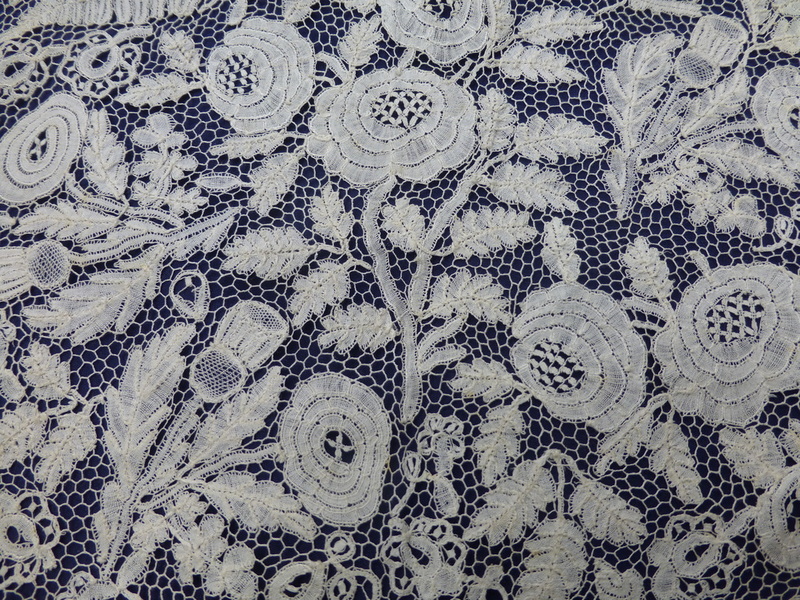 It is a part lace, differing from other British laces which are made in continuous lengths. Each Honiton motif is built up of individually worked shapes and braids, leaves and petals. These may then be joined to make larger pieces, working bars, net or fancy filling stitches in the spaces. These 'fillings', of which there are countless variations, are a particular feature of Honiton lace. 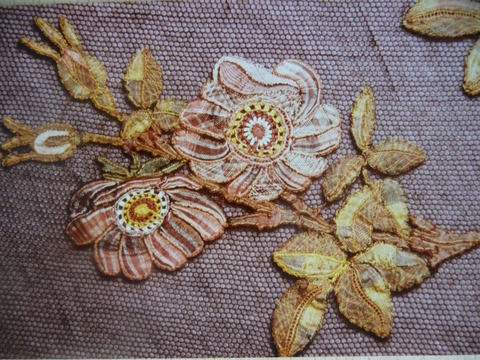 Another of its beauties is its pictorial nature, as the part lace technique lent itself to the working of flowers, leaves and butterflies, nowadays lends itself to the making of many modern designs. Queen Victoria and all her daughters, as well as Queen Alexandra and Queen Mary, were married in Honiton lace, while the original Royal Christening Robe, made for the christening of Queen Victoria's first child, the Princess Royal, in 1841, was a gift from the lace makers of Woodbury Parish. The replica christening robe, ordered by Queen Elizabeth II was first worn by Viscount Severn, in April 2008. 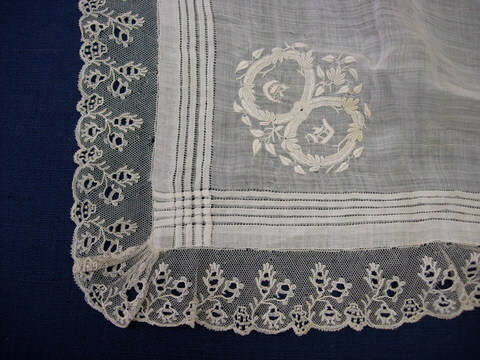 When machine-made net was invented early in the 19th century Honiton motifs were applied to make veils and other items. Poorly worked and designed pieces of Honiton lace probably date from this period as those who made the lace and those who dealt in it struggled to compete with the lace the machines could produce, although they were unable to actually reproduce Honiton lace. Honiton lace has become the generic term used for this lace, although it was produced all over East Devon. This came about from two historical facts: firstly the 1685 Memorandum showed there to be more lace makers in Honiton than in any other East Devon town or village and secondly because Honiton was the collection point for the boxes of lace to be taken by coach to London and Bath. Today Honiton lace lives on as a beautiful and absorbing hobby, thanks to the Devon Lace Teachers and those who have learned form them. DEVON TROLLY LACE is a lace that is worked in a continuous length and so is quite different form Honiton lace. It was known that this was made in Devon, but it was almost a 'forgotten lace' until a chance discovery in the village school of Woodbury Salterton, in 2002. 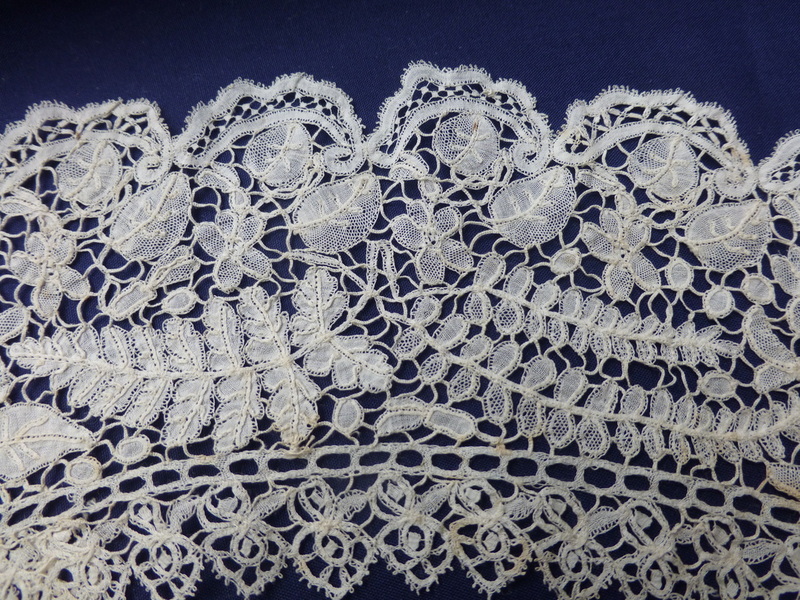 The discovery was a collection of hundreds of small samples of this lace and evidence that some of it was purchased by Queen Victoria from the lacemakers of Woodbury Parish. 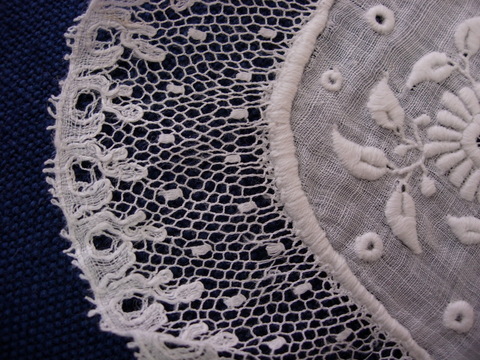 It is a fine lace, a Point Ground lace with its net ground, and only a few of the patterns have been found to be common to other British Point Ground laces. 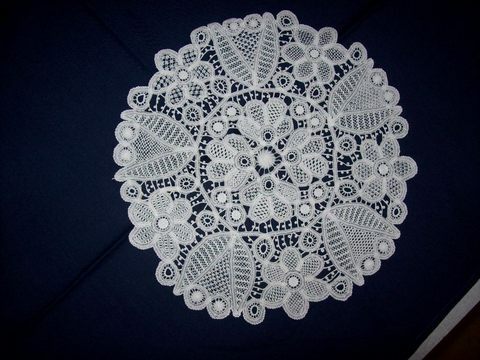 One of the Devon Lace Teachers has been hard at work researching this find and a number of patterns have been worked for the first time in well over 160 years by her and some of the other teachers. BRANSCOMBE POINT is the only Devon needle-made lace. It was introduced in the 19th century in the East Devon village of that name, as a quicker, though still time-consuming, way of making lace. A woven tape, made to look like Honiton braid, is tacked on to a pattern drawn on a double thickness of firm brown paper. Fancy filling stitches are then worked with needle and thread in the spaces of the pattern. 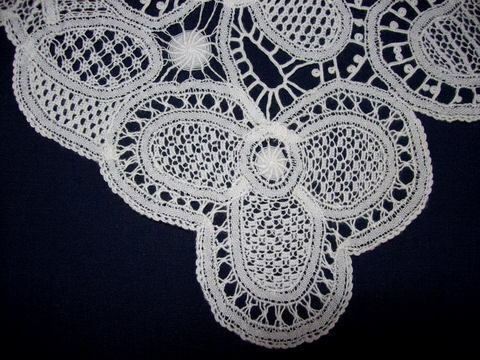 A heavier thread is generally used than that used for Honiton lace, making a more solid article. True Branscombe Point is recognised by the variety of filling stitches and by the 'purl' edging worked round the finished piece. 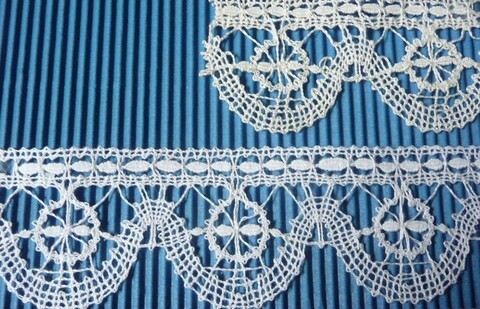 This lace has been revived and is taught by some of the Devon Lace Teachers. 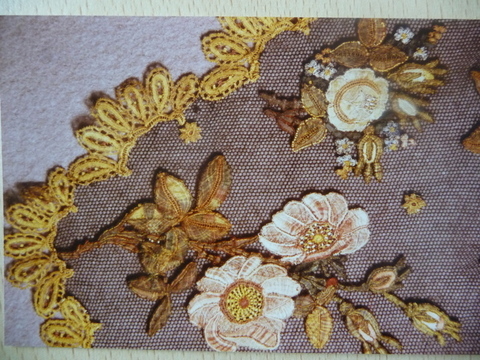 HONITON POINT was a do-it-yourself lace for which kits were sold in the late 19th and early 20th centuries. It consisted of a pattern transferred on to coloured material and lengths of machine-made tape, plain and in the form of a string of small leaves, imitating Honiton lace braid and leaves, being tacked on to the material. The spaces were filled in with a variety of filling stitches, although much simpler than Branscombe Point stitches. Strictly a much debased version of Branscombe Point, it was sold as Honiton Point because Honiton was the better known name. Unfortunately some ladies were deceived into thinking they were making Honiton lace! COLYTON CHROMATIC was a coloured bobbin lace. A piece was entered for the Great Exhibition of 1851 by W.L.Gill of Colyton, Devon; a shawl of softly coloured roses applied to black machine-made net. This example is now in the Victoria & Albert Museum, London. KERSWELL LACE is little known. A border of coloured bobbin lace, designed by Maud Searley with threads specially dyed by A.W. Searley of Kingskerswell, was exhibited in 1889. 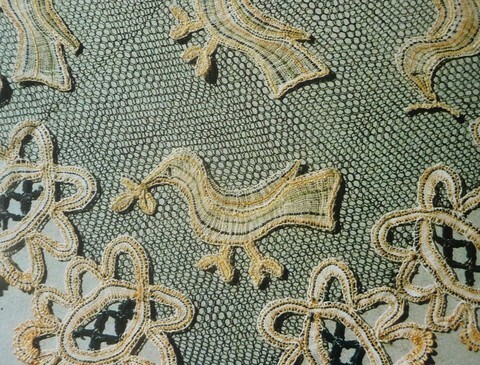 This may be the lace with coloured Honiton motifs on black machine-made net, now in Allhallows Museum, Honiton. WOODBURY GREEK was only made in this parish during the 19th century. It is reputed to have been introduced by Queen Adelaide returning from convalescence in Malta, in 1839. It was made in a heavier linen thread and a few samples were found in the Woodbury Salterton Lace find of 2002. One of the Devon Teachers has reconstructed the two known samples.